The Boston University Terriers will go on the road to take on the West Virginia Mountaineers Thursday. In the last game of non-conference play, the Terriers (1-6-1) are looking to generate some momentum. 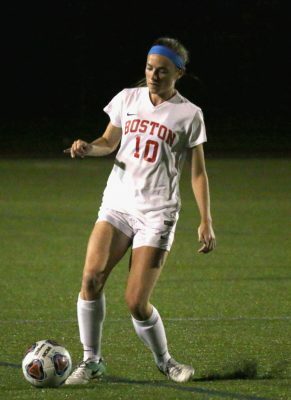 After suffering a close loss to Boston College Sept. 6, BU rebounded slightly by forcing a tie against Dartmouth College Sunday. Despite the blank scoreboard, BU head coach Nancy Feldman said she saw improvement in the Terriers’ play through the second half. The team earned eight corner kicks and amassed 16 shots. This offensive push was matched with defensive play that resulted in only five fouls. When BU takes the field during Thursday’s matchup against West Virginia University, there will be offensive power on both sides of the field. Just two weeks ago, the Mountaineers (2-2-3) outshot their opponent 32 to 6, 10 of which were on-goal. Despite the high shot production, the match ended in a 0-0 tie. BU has averaged 12.5 shots per game, maintaining a narrow margin over its opponents’12.4. Feldman said she is hopeful that the team will be more successful at scoring goals. Thus far, the Terriers have been shut out in four games, including three losses and a draw. West Virginia played its first multi-goal game Aug. 30 in a 3-0 victory over Xavier University. The team’s only game that was neither a tie nor a shutout occured in its most recent match against Clemson University. West Virginia has gone into three draws so far this season, all during late August. Along with a focus on finish, Feldman emphasized the importance of the team having endurance. In 2017, the Mountaineers made their 18th-straight NCAA tournament championship after posting a record of 16-4-3. West Virginia has since lost some of its top players, including 2017 co-Big 12 Defensive Player of the Year Amandine Pierre-Louis and four-year top scorer Michaela Abam. All seven of the Mountaineer’s goals have come from different players, with an additional five players having points on the season from assists. Senior midfielder Grace Cutler is the only West Virginia player with both a goal and an assist. Last season, Cutler recorded four points on one goal and two assists. Seven players have broken double-digit shot attempts, led by senior forward Nadya Gill. Mountaineer goalkeeper Rylee Foster has allowed a goals-against average of less than one in seven starts and has maintained a .739 save percentage. Through her last two seasons at West Virginia, Foster held opposing teams to 20 shutouts, bringing her goals-against average down to 0.55. After facing the Mountaineers, BU will travel to Washington D.C. to play its first Patriot League team of the season, American University. The Eagles (5-1-2), who will also be playing their first Patriot League match, currently lead in the Patriot League standings. After winning three straight games at the end of August, American dropped its first loss of the season Sept. 1 after a double-overtime match against the Virginia Military Institute. Led offensively by senior forward Yari Bradfield, the Eagles average 16.8 shots per game and 1.5 goals per game. The Terriers will face freshman midfielder Emily Smith for the first time, who is second on the team in assists with three. Sophomore goalkeeper Ryleigh Brown has started the majority of the Eagles’ games and has made 28 saves so far in the season. After making six saves for her third shutout of the season in a game that ended in a tie against Monmouth University, Brown was named the GEICO Student-Athlete of the Week. After reflecting on the team’s non-conference play performance, Feldman said she is optimistic.